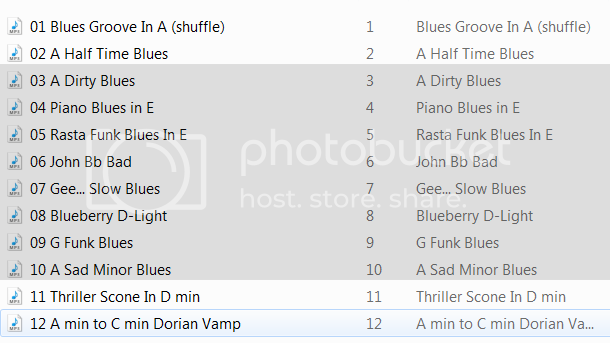 Can someone tell me the key of each of the tracks in the Blues Solo CD set (Jam Track CD). Hey, i have an acoustic guitar. I am trying to learn these licks, however its really difficult on my fingers to perform the bends... Is an acoustic guitar not suitable for the same? Btw, how do i purchase them? You could also try tuning your guitar down a half seep or whole step to try to get the bends working. So to play over an A blues play at the 7th fret instead of the 5th fret. I'm finding lick 4 to be difficult, mainly doing the pull-off using the 3rd finger. Anyone else find it much easier to use their pinky? Just started Blues Lead 1 ten days ago and been focusing on the first 5 licks from the E shaped Minor Pent, the question is more related to bending technique but I could not find that thread, so mods please move if you deem necessary. So following Justin's advice, having looked and attempted the 5 licks from pattern 1, this week I have been focusing on just the first three - yeah I know he says to work on just one but I wanted to mix it up a bit. I've now broken a couple of "e" strings and wondered if I was doing something wrong or this was all part of the learning process, until you master the technique. I'm am also using a combination of ear and tuner (to verify what my ears are telling me) so will obviously over bend at times ......... but getting there. I'm using 9-42 on my Strat and switched to my HSH Affinity last night which has 10s and found the "e" bend almost impossible. So is there anything I should avoid ? Like being to close to the fret bar ? Should I stick with 9s for now, while trying 10s now and then as the technique improves. I am currently doing the same 5 licks as they are in the blues rhythm course. I have 9s on a strat and no breakages. I think you need to look for sharp edges on the saddle. Where does the string break, it may give a clue as to the cause. Two of the main things to look for if your guitar is set up well are too aggressive picking and pressing the string down too hard when you bend it, it doesn’t need any more pressure than to fret a clean note; it’s all too easy to press too hard! The e string from machine head to the brake, was between the 7th and 8th frets, so given stretching, directly where I was bending C to D.
There's no rough edges on the nut or frets that I could see or feel replacing the string, so I guess I'm being a bit heavy handed. So I'll see how it goes. Anyone have the new link to this?